Giant Galapagos tortoises may hold the key to finding a cure for cancer and other age-related illnesses, according to new research. Genes that protect against the development of fatal diseases have been identified for the first time. The breakthrough explains why they have a life expectancy of around 150 years almost twice as much as a human. An international team has mapped the DNA of two giant tortoises including ‘Lonesome George’, a symbol of the Galapagos Islands before his death in 2012. They discovered mutations that boosted their metabolism and immunity and reduced the risk of tumours or inflammation that can trigger a host of conditions. In 2010 her lab began sequencing the whole genome of the giant tortoise to shed light on the emergence of the shelled creatures which helped inspire Charles Darwin’s theory of evolution. Co-author Professor Carlos Lopez-Otin, a cancer specialist at Oviedo University in Spain, then analysed this data and other species of tortoises to look for variants associated with longevity. Long-lived organisms are theoretically at a higher risk of cancer, one of the major age-related diseases. But giant tortoises have specific alterations in two genes whose over-expression is known to fuel tumours, said the researchers. The other genome that was sequenced was from the Aldabra giant tortoise (Aldabrachelys gigantea), the only living species in the Seychelles in the Indian Ocean. Comparing these to those of related species revealed positive selection and expansion of genes linked to metabolism regulation and immune response. These could be behind the exceptionally large sizes and long lives of the tortoises, said the researchers. Dr Caccone said: “Giant tortoises are among the longest-lived vertebrate animals and, as such, provide an excellent model to study traits like longevity and age-related diseases. “However, genomic and molecular evolutionary information on giant tortoises is scarce. “Here, we describe a global analysis of the genomes of Lonesome George – the iconic last member of Chelonoidis abingdonii – and the Aldabra giant tortoise. “Comparison of these genomes with those of related species led us to detect lineage-specific variants affecting DNA repair genes, inflammatory mediators and genes related to cancer development. The data will also help improve understanding of its biology and aid conservation efforts in the Galapagos Islands. The giant tortoise is listed as vulnerable by the IUCN. She added: “The analysis of the resulting sequences offers candidate genes and pathways that may underlie the extraordinary characteristics of these iconic species – including their development, gigantism and longevity. “A better understanding of the processes that we have studied may help to further elucidate the biology of these species and therefore aid the ongoing efforts to conserve these dwindling lineages. George was the last of a sub-species of giant tortoise that lived on Pinta Island. He was only discovered plodding around in 1972. With no offspring and no other known members of his group he became famous as the world’s rarest creature. When he died six years ago he was believed to be about 100 years old. 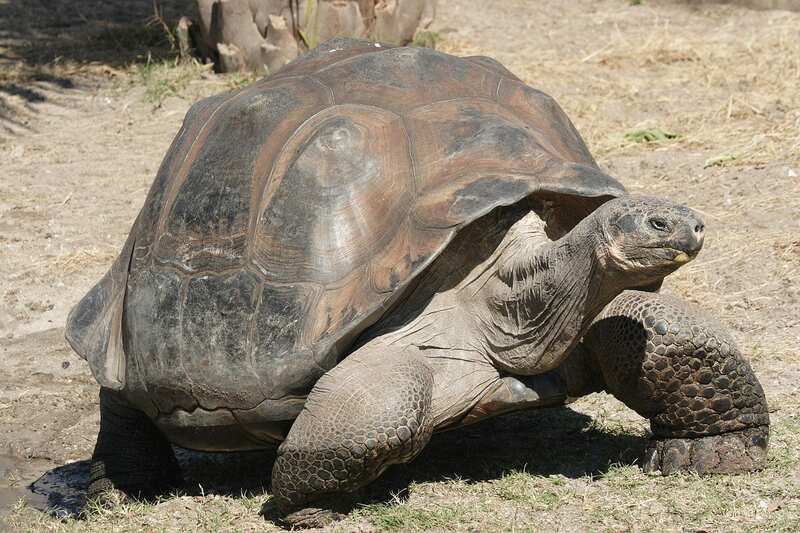 But he and other giant tortoises are still providing genetic clues to individual longevity. The researchers – who also included experts at the Galapagos Conservancy and the Galapagos National Park Service – based their findings on an analysis of DNA from George and samples from other giant tortoises. They can even live for more than 100 years in captivity thanks to a number of gene variants linked to DNA repair, immune response and cancer suppression. These are not possessed by shorter-lived vertebrates, reported Nature Ecology & Evolution. George’s plight led to a series of ill-fated attempts to provide him with a mate, with environmentalists trying to get the Pinta Island tortoise to reproduce with females from a similar sub-species. The 14 stone tortoise lived for 15 years at a breeding centre on the archipelago’s island of Santa Cruz and got on famously with two females from the Wolf Volcano, but the eggs they produced were infertile. Two females from Spanish Island’s tortoise colony, thought to be even closer to him in genetic make-up, were also placed with him, but again it proved fruitless. With his distinctive saddleback shell and a pose where he extended his long legs and neck whenever humans drew near, he became a popular attraction.